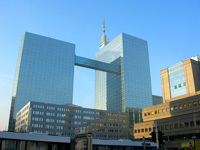 Brussels-National Airport, also known as Zaventem Airport (from the name of the municipality where it is located) is a major European airport, with flights to and from most major destinations worldwide. The former Belgian airline Sabena went bankrupt in 2001 and was replaced by Brussels Airlines, which merged with Virgin Express in 2006 to form Brussels Airlines, but operates only in Europe, Africa and North America. If you can't get a direct flight to Brussels-Zaventem Airport, most European airlines have connections to Brussels. Another easy way to reach Brussels (and possibly cheaper) is to fly to Paris Charles-de-Gaulle Airport, then take the Thalys bullet-train from the airport to Brussels-South Station (59min). By plane, the cheapest way to reach Brussels is using a low-cost Internet airline like Brussels Airlines, easyJet, or the even cheaper but less convenient Ryan Air. Note that Ryan Air does not serve Brussels-Zaventem Airport but Brussels-Charleroi, which is in the province of Hainaut, between Mons and Namur (see Map). By train, the Thalys bullet-train links Brussels South Station to Paris North station (1h20min) and Paris CDG Airport (1h), while the Eurostar bullet-train connects it to London St Pancras station (1h50min), via Lille (40min) and Ashford. The Thalys also connects Brussels to Amsterdam (2h45min), Rotterdam (1h40min), Aachen (1h35min) and Köln/Cologne (2h20min), among others. There are also direct Inter-City trains between Brussels and Frankfurt-am-Main (3h35min), via Aachen (1h30min), Cologne (2h10min), Bonn (2h30min) and Limburg-an-der-Lahn (2h55min). => See the Getting Around section. By coach/bus, Eurolines has buses to all major cities around Europe. If you are travelling only between big European cities, the Eurolines pass is the cheapest way. There are passes valid for 2 weeks, 1 month or 2 months. The longer the cheaper, and it is also considerably cheaper during the off-season (all year but mid-June to mid-September) or if you are under 26 years-old. The Belgian National Railway has 4 trains per hour between Zaventem Airport and the city. The journey takes from 20 to 25 min to Brussels-Central and cost 2.6 €. Alternatively, there is an express bus (3 €) between the airport and Brussels-Luxembourg Station (EU district), calling at NATO, Germinal, Genève, Diamand and Schuman. 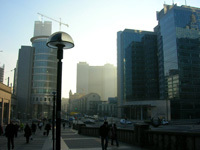 Brussels has trains to all main cities, usually within 1 hour, except in the Province of Luxembourg. Trains from/to Luxembourg City take 2h35 to 2h55min. Timetables and fares are available on the Belgian National Railway website. Here are the fares (without discount) and quickest journey times to/from a few major Belgian cities, with the closest train station in Brussels. Note that a 10-ride Rail Pass can be used between any two stations in Belgium for 6.8 € per ride (4.5 € for a similar Go Pass until 25 years old). 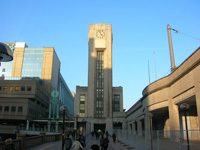 There are five main railway stations in Brussels. Make sure to know which one if the most convenient for you. Brussels-Luxembourg => to the east, for the EU Parliament and EU district. Brussels-Schuman => next to the Jubilee Park, for the Berlaymont building (EU Commission) and EU district. Trains from other Belgian cities or from Brussels airport stop at Brussels North, Brussels Central, and Brussels South (most commonly known as Bruxelles-Midi - Midi meaning "noon" and referring to the south in French). Trains to or from Namur and Luxembourg also stop at Brussels-Schuman and Brussels-Luxembourg stations.